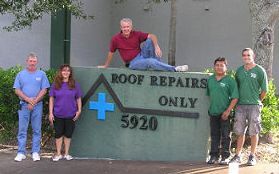 In 1989, Jim Parks established a roofing repair company, Doctor Roof of Vero Beach, Inc. Today Jim presides over the Roof Repairs Only corporation as owner, with the same business format. Jim Parks secured his Residential Contractors License in 1980 and General Contractors license shortly thereafter. He became licensed as a Roofing Contractor in 1989. David Martz became a licensed Roofing Contractor in 1997, has been with us since 1992. Jim Parks and David Martz have worked together in the same roofing repair business since 1993. Mr. & Mrs. Parks have been married since 1972. This longevity in relationships clearly shows our commitment and perseverance. These same principles have made us successful in the roofing business, without parallel. You will find no other company in this industry that has committed to the challenge of doing only roof related repairs. The “modus operandi” includes roof repairs, elimination of rodent entry from roofs as well as the entire home. The licensing as a General Contractor in combination with Roofing allows for the removal and replacement of the engineered, structural makeup for frame construction. Roofing Contractors without the inclusion of such additional licensing, must include the incorporation of another contractor. This can be costly both in time and money. So often the hidden damage from a leaking roof will include structural damage. Because of our company's independent licensing for this work, you will reap the benefits and escape the frustrations of less qualified contractors.